I've maxed out. 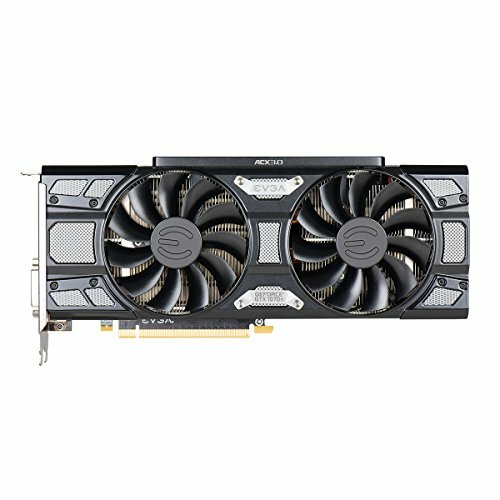 Bought an RMA'd EVGA GTX 1070 Ti SC for $480 all-in with a couple years left on warranty. Seemed to be the best value going out there. RTX are far too expensive, as are the GTX 1080 series, to warrant any investment at this moment. So far, so sweet: very powerful card, great temps, and quiet on the whole. Noise levels are low, even when audible--it's not as noisy as the 1060 SC at higher temps--so it's a win-win-win. I swapped out two HDD drives cannibalized from old laptops that were nearing their end of life. 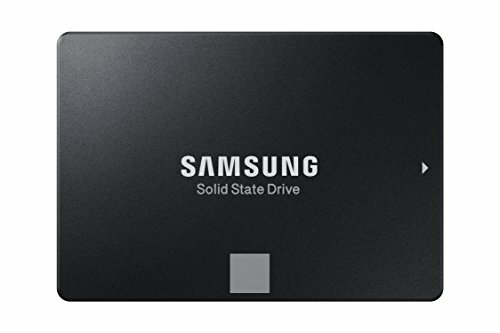 Bought a Samsung 860 EVO SSD 1 TB (it's fast as promised) and retained only the Seagate Barracuda 3.5 HDD 1 TB for long-term storage. Streamlined it. Overall I can't say that I've done badly since this project began in 2015--logical increments, indeed--and this will likely be the nadir of my build for the years to come. Things are purring along nicely. Peace to all the builders. 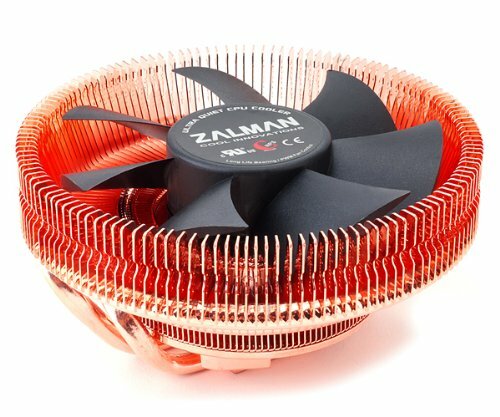 I began updating the build last year, September, 2016, by changing out the stock cooler for the Zalman CNPS8900. It's a very quiet cooler, and while it wasn't necessary for the Intel G3258 I was running on a 4.4 OC, it had been discontinued and I was anxious to pick it up while still available from secondary sellers. Around the same time I bought the Witcher III without really paying attention to the fact that it's a AAA title that would bomb my machine. The more I played, the more often I began to pay attention to the i5-4690K and i7-4790K prices and noticed that they were beginning to either rise or no longer be available. By the time I was ready to make the call, the i5 was no longer retailing at a reasonable price, so I went with the i7 and there are no regrets. Runs hot as noted, but not especially so. Having upgraded the CPU meant the older GPU--a rock solid, dead quiet, energy sipping--EVGA GTX 750 Ti would then bottleneck...and, of course, one thing led to another. I at first went with a MSI Radeon RX480 4Gb at a great price. However, its fan profile was far too loud at >50C temperatures: akin to a plane taking off. So I traded it in and went with the pricier, more powerful, and quieter EVGA GTX 1060 6Gb SC. It's been great, and EVGA warranty was a deciding factor as well. Excellent frame rates and silent. Another thing leads to another--why not, right?--and I went for bragging rights with another 8Gb of HyperX RAM while, it too, was still available at a reasonable price. It's interesting to me how the colour of the metal cover has changed on the older stick with use. I presume it's the paint having changed with heat over two years of use. The last two moves were upgrading the case fans. First, I removed the Corsair 120mm side fan as it felt a bit cluttered in there, and changed out the Gelid blue 120mm for a Noctua PWM 120mm NF-S12. With the release of the new Noctua PWM 200mm I switched out a Phantek PWM 200mm I'd bought on sale six months back which, while good, wasn't as quiet as I'd hoped it would be. One thing to note is that the Noctua 200mm is bigger than the Phanteks 200mm--and its screw mounts did not align perfectly with the case mounts, but this was overcome with Noctua's included silicon screw-plug thingies. The other point is that the Noctua 200mm does not let you keep the CD/DVD drive bay above it and it must be removed to keep things functional. 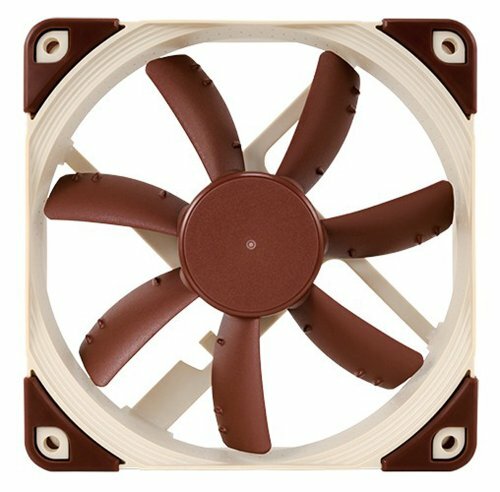 As for the 120mm fan choice, I'd also looked at the Silentwings 3 PWM120mm, but these were ultimately out of stock at the time and I thought I'd like a pure Noctua setup when the 200mm eventually came out. Noctuas live up to their quality and very quiet reputation--and price--and, for what it's worth, I like the idiosyncratic colours. Air temps are excellent and the fans do move air well. I'll single out the NF-S12 120mm fan for special mention--it's incredibly effective and dropped the CPU temps by a couple of degrees. For now, that's it. The modest machine has now become a bit stronger. It's been fun, and the next step can only be a M.2 drive, likely a Samsung Evo 960 500Gb, but we shall see...custom wiring anyone? Some follow-up reflections on the other components: the Corsair 250D case has been excellent, truly a great housing unit for a mini-itx build. The one downside is the overly bright power/hdd lights, but a little bit of tape solves that. 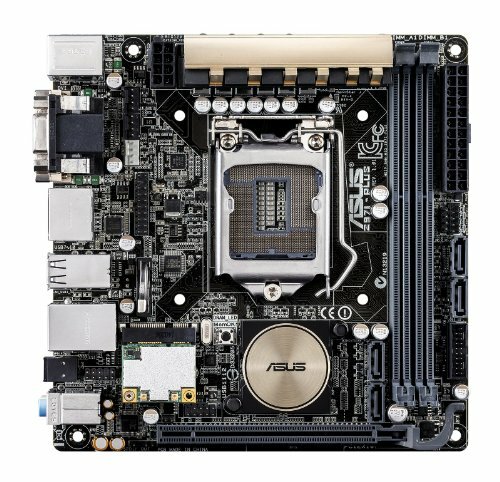 Otherwise, the ASUS Z97i-Plus mobo has been rock solid, easily overclocking without a hitch through a great BIOS. The EVGA 750 G2 Gold PSU has been equally rock solid. I don't think the PSU fan has gone on once, likely due to my relatively lower power demands, but I like to think it's also because of a good air setup since day one. Cheers and a big thanks to the community here! This was my summer 2015 hobby project and my first build. My thanks to all the pcpartpickers out there whose builds informed mine. Kudos to this site & logicalincrements.com. To all Reddit buildapc subredditors: keep up the great work. Back in April, I helped a friend assemble his Reddit AMA gaming build--a $2,700 CDN beast--and was inspired to try my hand at making my own. The plan had been to build something in the $600-$800 CDN range (approximately $450-600 USD). My baseline criteria was to keep it simple, and be able to play better games on it than what I could on my laptop. I lean towards games that sell at a discount, so rarely will I buy the cutting edge of gaming. That said, I wanted something respectable that could hold its own. Otherwise I would have been better off with a console. There's always that tension: the consoles are streamlined machines to which developers calibrate their games, getting the best performance possible, and the console price is less than a comparable PC build. Of course, building a PC is more than just using it: the ideal is that you learn from the experience, and get something out of that as well. The name of the build? I knew that I'd be without my girlfriend for the coming year, so I would have evenings to spend on my own more often than not. You can only go to the gym so much, and even then, that doesn't use up the entire night. And playing games at the end of the day is both healthier and cheaper than going to the bar several times a week. Never mind that winters can be long in Canada. Price-wise, I feel I went over my budget. The total price reflects two rebates from EVGA on the PSU & GPU, $20 off both items. I bought all parts from Canada Computers and had them delivered to my local store, eliminating all shipping costs. There's a slight price advantage in buying from different vendors, but shipping costs and the potential difficulty in dealing with different merchant warranties made it more reasonable to deal with a single retailer. End of the day, go with what makes you comfortable, and Canada Computers has been a solid retailer with great customer service. 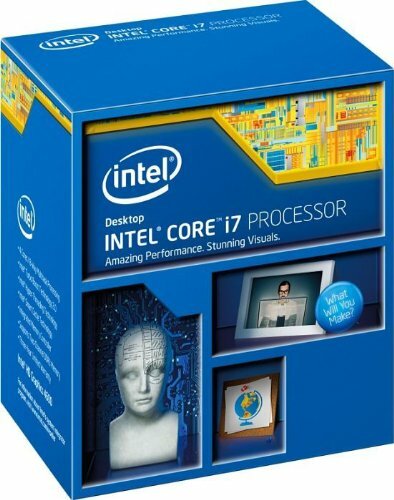 Before getting into the item-by-item breakdown, a final criteria: I wanted to have the capacity to upgrade this computer down the road, and this informed all my parts purchases. Future-proofing is difficult, given the future is uncertain, but some careful thought can insure against likely technological dead-ends. In that vein, read on and please enjoy. I like small and compact technology. In my mind, technology is size related: the smaller it is, the more advanced. It's arbitrary to think this way, but that's also the inspiration behind a lot of science innovation: make it better, make it simpler, make it more efficient. And, if you've ever moved more than once in your life, you appreciate that less lifting is more happiness. I also prefer the absence of clutter in my home, and having a build that tucks away and is unobtrusive is attractive for interior design. Without a doubt, a normal case tower gives you ample room for working in, managing cables, and allowing for air passage and any sized third-party CPU cooler. Since I wasn't going for the biggest, baddest, beast out there, I went for compact case while maintaining good airflow, dust-control, and potential for future upgrades. 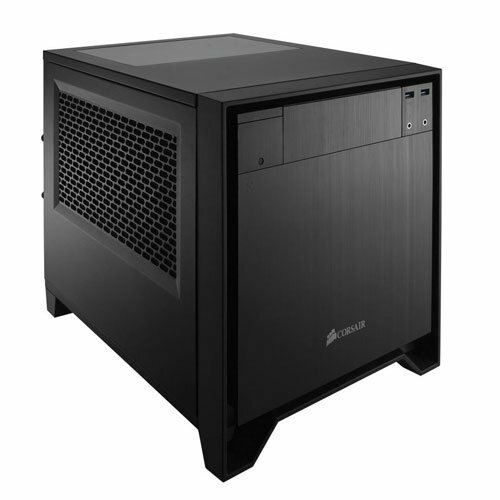 What tipped the scales in favour of the 250D as opposed to the worthy Thermaltake Core V1 Extreme, Coolermaster Elite 110, Fractal Design Node 304, EVGA Hadron Air, or the NCase M1 were the built-in magnetic-attached dust filters (front intake, both side intakes, and the PSU intake on the bottom), ability to handle any sized ATX PSU, full-sized GPU, and how well it was built. Overall, it's a very solid, well-machined case, and has been very easy to work with. Quality costs something, and I was lucky enough to get this at a 25% discount. Overkill? I actually went down from the 850W edition, which had been recommended by a knowledgeable friend--shout out to Sony--though it was only another forty dollars. The reasons why I went with this PSU had to do with power supply physics and longevity. The fact is that my build won't draw nearly as much as this PSU can provide. Fair enough. What I've learned though is that this will keep my PSU in a lower temperature range, extending its life span. This PSU also has an eco setting that keeps its fan off until the PSU reaches ~40C, keeping noise levels low as well. Being environmentally-conscious, efficiency is worth investing in and the Gold rating made a lot of sense to me. If I do decide to increase my power draw down the road with a more powerful CPU and, or, GPU I'll have ample headroom to manoeuver. That this PSU has a ten year warranty and is from a well-respected OEM made this purchase a sensible buy. It added another $80 dollars to the base price of the build, but you can't have your cake and eat it, too. For that matter, paying more provided for a modular PSU, quality black-sheathed cables, and velcro ties. High value, high overclock potential. Being my first build, it's also my first overclock. My research showed that the Pentium's two threads is fine for the time being and, while four threads is the future, the number of games I would want to play that absolutely require four threads is less than the fingers on one hand. Around 30% of these chips will unfortunately not overclock as well as the other 70%, due to variable nature of manufacturing. I was lucky with mine and have achieved a Prime95 tested 4.3Ghz @ 1.25V using the auto overclock settings in the ASUS UEFI BIOS. Very easy, very stable. Core temps are well within norm; using Real Temp, the temperature sits around 30C at idle and 70C under game conditions. A 33% increase in performance is impressive; let's just see how long the CPU lasts. The ideal would have been an MSI R7 265. Problem is, everyone else wants one, and the base price of an R7 265 has skyrocketed with demand for this as (what I presume is for its use as) a digital coin miner, eliminating the price-to-performance advantage. The next best thing within my budget was the GTX 750 Ti, and the upside was the high power efficiency, quality, and good performance. Bottlenecking at the CPU was another consideration other than price point, of course. Otherwise, the small form of this GPU allowed for better airflow in the case. This was an interesting topic to learn about. The Intel stock cooler rates very well for low noise at frostytech.com and while it isn't very strong as a cooler according to silentpcreview.com, it is free and specifically designed for the chipset. According to the forums, the stock cooler also allowed for ample overclocking, provided you had good airflow in the case. I counterbalanced the heat and airflow considerations against the case and GPU I chose. A nice little part from a laptop of yesteryear, may it rest in peace. Technically, I should include the purchase price in the build, but this seems a debatable point. The cost of the adaptor case was included, so in any event a quality 1Tb disk drive would have set me back by $70, or $22 more to the total listed build price. I will add an old 2.5" 7200 rpm Toshiba hard disk to the build down the road, also from the laptop of yesteryear. The stock fans are relatively quiet and the case being well-built dampens fan noise. The Gelid I found on sale and I like the blue colour: it matches the RAM. Having two 120mm fans on the side of the case takes advantage of the available slot that was there. I reversed the stock 120mm fan so that it is now an intake fan, making all of my fans intakes, PSU and GPU included. With so much positive air pressure, this is a passive exhaust configuration that, to all appearances, works very well. I may eventually change all the fans to Noctuas (even upgrading from a 140mm to a 200mm fan, should Noctua ever produce one), add two 80mm exhaust fans, and purchase an after market cooler. For now, temps are within tolerance and noise-- even under load--is low. Not silent, but quiet all the same. I've tried to be as good as possible about cable management to improve air flow, and the spacious case design has been helpful in this respect. It's like playing with Lego, and it costs more than Lego. But not that much more, mind you: do a search for the Lego Deathstar. Powerful last-last-last generation CPU, with good OC capacity. It'll also stay effective for a while yet, still holding it's own in 2017 according to the benchmarks. Not only that, it's VR-ready should I ever decide to invest in the tech. This cooler is really cool looking. It's also very quiet, and it's fun to have as part of my build. The only criticism is how challenging it is to install, at least for the first time (I had to reapply the cement). While not impossible or overly difficult, it is a slow-going installation. While not as powerful as cooler as some other newer models out there, it is a uniquely designed cooler and, for that, it's worth it in my books. Fast and efficient. 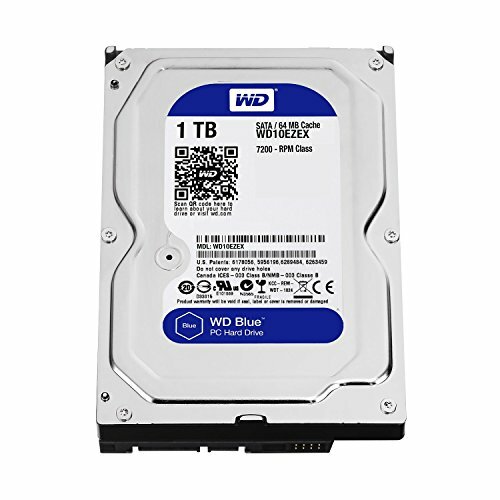 1 TB. Reasonably priced under $200. What's not to like? Go for it. Black edition is not overly LED'd. You can download the LED controller of yore and shut that off if you're not into the lighting as I am. Otherwise, great performance at a great price point. EVGA transferable warranty is a beautiful thing. One star docked for the noise which could be better although it is good. 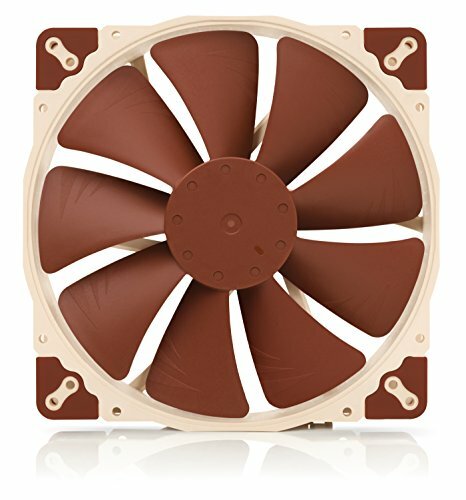 Noctua/Silentwings marriage with EVGA? Just sayin' it would be a beautiful thing. I like small and compact technology. In my mind, technology is sized related: the smaller it is, the more advanced. It's arbitrary, but that's also the inspiration behind a lot of science innovation: make it better, make it simpler, more it more efficient. And, if you've ever moved more than once in your life, you appreciate that less lifting is more happiness. I also prefer the absence of clutter in my home, and having a build that tucks away and is unobtrusive is attractive for interior design. Without a doubt, a case tower gives you ample room for working in, managing cables, and allowing for air passage and any sized third-party CPU cooler. Since I wasn't going for the biggest, baddest, beast out there, I compact size while maintaining good airflow, dust-control, and potential for future upgrades. What tipped the scales in favour of the 250D were the built-in magnetic-attached dust filters (front intake, both side intakes, and the PSU intake on the bottom), ability to handle any sized ATX PSU, full-sized GPU, and how well it was built. The reasons why I went with this PSU had to do with power supply physics and longevity. The fact is that my build won't draw nearly as much as this PSU can provide. Fair enough. What I've learned though is that this will keep my PSU in a lower temperature range, extending its life span. This PSU also has an eco setting that keeps its fan off until the PSU reaches ~40C, keeping noise levels low as well. Being environmentally-conscious, efficiency is worth investing in and the Gold rating made a lot of sense to me. If I do decide to increase my power draw down the road with a more powerful CPU and, or, GPU I'll have ample headroom to manoeuver. That this PSU has a ten year warranty and is from a well-respected OEM made this purchase a sensible buy. It added another $80 dollars to the base price of my build, but you can't have your cake and eat it, too. For that matter, paying more provided for a modular PSU, quality black-sheathed cables, and velcro ties. Five star quality, but four stars for not being fully compatible with the Corsair 250D case. It's a shame given how quiet and efficient the fan is, but as I've noted in my build, the fan is too large to allow for the CD/DVD tray above it to be installed in the case. It's not a deal breaker in my build since I rely on an external CD/DVD player for those rare occasions it's needed, but for others who do have an internal CD/DVD drive, this could be a very disappointing problem. No mate. Jipster let you beat him. I like to see the mini GTX card as well. The **** is with all these Jipsters??? It's a nice little build tho I think the psu wattage is excessive, to the extent it will actually hurt it's power efficiency, even taking possible future expansion into consideration I prolly woulda gone for 450-550w myself (iirc Falcon Northwest had a build with a 4690k (or 4790k, I forget tbh) and the original gtx Titan powered by, again iirc, a 450w psu). I thought the most efficient point of a psu is when they are running at about half their peak wattage. So if he wants to over-clock, than that should be in the right spectrum. Overclocking a g3258 & a 750ti is gonna add about 200w? I'm not convinced tbh. You totally beat me to it, dude. Thanks! And for sure: I've had some reservations as well about the power. My understanding was that generally you don't want to operate near the upper wattage limit of a PSU for a couple of reasons. The major one is that the listed power supply won't be achievable years down the road. A 750W PSU won't be able to reliably hit 750W in, say, five years of steady use. Entropy is inevitable, especially with wear and tear. The other is that running the PSU near max will wear it down more quickly, leading to a faster degrading of its maximum power supply. One thing I didn't realize was that a low power draw on a PSU undermined its efficiency; I thought that wasn't a factor. Do you have a link I could check out? A 750W PSU won't be able to reliably hit 750W in, say, five years of steady use. Entropy is inevitable, especially with wear and tear. The other is that running the PSU near max will wear it down more quickly, leading to a faster degrading of its maximum power supply. There was a jonnyguru (one of the premier psu review sites) video interview a few months back and iirc at one point he said that a good quality psu should be able to deliver its max rated load for it's life span, or something along those lines anyway. Sure, but you're nowhere near max load, as per the site estimate, 162w / 750w = 21.6% load. If you check almost any psu review that breaks down loads you'll see that a ~20% load gets lower efficiency than pretty much any other level^ and unless you're running it overclocked and highly stressed 24/7 I would imagine you'll be operating at an even lower than 20% load in many cases. The general trend is newer parts will be more efficient, consider the 970 (or entire maxwell range) for example, both considerably more powerful & more power efficient than it's predecessor, and that's without dropping a process node (manufacturing size) which is where the big power savings have traditionally came from. Anyway, I'm not trying to bust your chops, it's just not the psu wattage, upgrade plans or not, I would've aimed for. ^ tho to be fair on a good gold rated unit it's usually only a handful of percentage points. I'm intrigued by the G3258 performance. I'm definitely considering it for a budget gaming/htpc build. You can definitely OC the G3258 using a cheaper mobo...the manufacturers allow for it...the only tradeoff is that the stability might be compromised, long-term. Or so the forums reveal to the curious. End of the day, it's a powerful low-end chip that fights well above its weight class. Plus you get to learn about overclocking without fear. Have heard anything about delidding an Intel chip? Now that's the next level. Yeah...it's like an end of days kind of move. Upsides are terrific, but then again, so much to risk...unless you're very confident of your handiwork and line of attack. You got that little sucker to 4.3Ghz on stock cooling? Very nice! Thanks! It's a work in progress--I'd like to have neater wire work, some quieter fans, a bigger better heat sink...all the usual increments. As it is, though, I'm happy with how things turned out. This site rocks. Thanks! I'm no expert on overclocking, but I can try to help. What do yo need to know? End of the day, I'd love to have lower temps (if only to OC a titch more), but one thing at a time. If I do get to the next level of investment, I'll be sure to update. Thanks, Radox! I'm going to add a couple of glory shots to up the fun factor. I'm hoping the first one... But, I couldn't tell you. My girlfriend read this, rolled her eyes, and asked: "are there any women on this site?"